"This summer, exciting young PopUp restauranteurs The Wandering Chef, are bringing London the ultimate cinematic-foodie experience together with PopUp connoisseurs Grub Club. They’re whisking adventurous guests into the heart of big screen classics, producing immersive cinema events with a gourmand’s twist and all between the 1st and the 28th floor of the Millbank Tower overlooking Westminster. Quite the package. 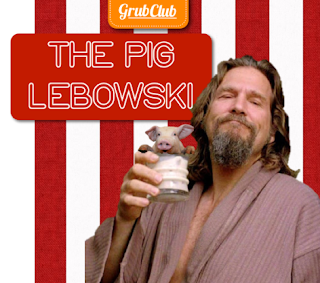 Screenings include The Pig Lebowski (27th July), Fries and Loathing in Las Vegas (10th August) & The Last of the Burritos (24th August), so no shortage of unnecessary puns to pull in the punters. These one-off events not only promise an impressive dinner and cinema screening for just £25, but also include (literally) all the trimmings. Food, Film, Great panoramic views of London and a free cocktail! With decorative bowling alleys and lookalikes shimmying you into the lifts, these events are taking PopUp Restaurants to another level (the 28th floor to be exact). The Pig Lebowski will be opening the series by inviting 250 guests to enjoy free White Russians whilst overlooking the city in the company of the dude himself*, and later tucking into ‘El Duderino’ & ‘Ferret Food’ whilst listening to Creedence Clearwater Revival. To top it all off guests get to sit down to everyone’s favourite film and there’s even an after-party if you can last that long! The Wandering Chef are busy combining their collective experience with Michelin starred chefs and on Fashion House production to pull this ambitious project off. Expect breathtaking views, delicious & surprising food, attention to detail, ice creams in the interval and all in one of London’s best kept secrets, The Millbank Tower Cinema.